BRUSSELS -- Much about Abdelhamid Abaaoud's path to armed Islamic radicalism remains mysterious. In the words of Koen Geens, the Belgian justice minister, he mutated from a student at an upscale Brussels school into "an extremely professional commando," one seemingly able to slip across borders at will. Someone who openly mocked the inability of Western law enforcement agencies to catch him. On Wednesday, the fate of the son of an immigrant shopkeeper from Morocco remained unclear. Police raided a suburban Paris apartment where they believed he was hiding. The siege ended with two deaths and seven arrests but no definitive information on Abaaoud, who French authorities have called the mastermind of the violence that killed at least 129 in Paris last week. The wanted jihadi's own father believes prison - where he served time for petty crimes - changed him for the worse. After his son got out, Omar Abaaoud noticed "signs of radicalization," the elder Abaaoud's lawyer, Nathalie Gallant, told RTBF broadcasting Wednesday. If so, that would fit the pattern of a number of jihadis who were radicalized in prison. A person in Belgium familiar with the investigation told The Associated Press that Abaaoud became "close" while living in the Molenbeek neighborhood to another immigrant's son who had his own troubles with the law, Brahim Abdeslam. The person spoke on condition of anonymity because he wasn't authorized to speak publicly. On Friday, Abdeslam was one of the suicide bombers who blew himself up in the murderous wave that shook Paris. Abdeslam's brother Salah, who authorities say also was an acquaintance of Abaaoud, is being sought as a suspected accomplice. Abaaoud came onto the international radar as a radical Muslim combatant for the first time in February 2014, said Jasmine Opperman, a senior director with the independent Terrorism Research & Analysis Consortium (TRAC). Western recruits had flocked to Syria from Europe and elsewhere to battle the forces of Syrian President Bashar al-Assad, and fighters from Belgium and other French-speaking countries were coordinating assaults north of Aleppo. During the campaign, Abaaoud was filmed at the wheel of a pickup truck dragging a load of mutilated corpses following a mass execution committed by the Islamic State of Iraq and Syria (ISIS) at a place called Hraytan. Abaaoud, by then using a nom de guerre, Abou Omar Soussi, wore the same kind of hat as many Afghan mujahedeen, and joked and appeared happy. "His father was very much against him going there," the Belgian source told AP. But there was much worse news for the family. Also in 2014, Abaaoud persuaded younger brother Younes, then 13, to join him in the territory under control of Islamic State. Though Belgium has produced more radical Islamic fighters relative to its total population than any other European country, the departure of the boy - dubbed "Syria's youngest jihadi" - made national headlines. It also made Abaaoud a household name here. "I first heard about him when I learned that he had gone to Syria and had taken his young brother," Francoise Schepmans, mayor of the Molenbeek-Saint-Jean district of Brussels, told AP. "This was a boy who came from a totally normal family ... he went to school in Molenbeek, and neither the social services nor the school could have imagined that he would leave." Molenbeek, in western Brussels, is a rundown industrial area now home to large numbers of immigrants from Turkey and North Africa and their descendants. It has been one of Belgium's most fertile grounds for recruitment by Islamic State and other radical Muslim groups. In July, the Belgian courts found Abaaoud guilty in absentia of kidnapping Younes. Gallant said the father believes his older son "wanted to pull him away from a bad education which he considered too Europeanized." Attempts by the AP Wednesday to contact the family were unsuccessful. A house in Molenbeek believed to be the family residence had the name "Abaaoud" on the doorbell, but nobody answered when it was rung repeatedly. A small faded Belgian flag was stuck into a first-floor window frame. Gallant, quoting the father, said he hopes that when current events are over, "I will finally learn what became of Younes." TRAC analysts last pinpointed Abaaoud in Syria in October 2014, fighting with a Libyan group named Katiba al Bittar, Opperman told AP. But his major focus reportedly lay elsewhere. French officials said he is believed to have links to two terrorist acts in their country earlier this year that were thwarted, one against a Thalys-high-speed train, the other apparently targeting a church in suburban Paris. Authorities in Belgium also suspect Abaaoud of helping organize and finance a terror cell in the eastern city of Verviers that was broken up in a Jan. 15 police raid in which two of his suspected accomplices were killed. But the storekeeper's son eluded them. "He likely snuck out again via Greece," Geens, Belgium's justice minister, said. But he said he wasn't sure. 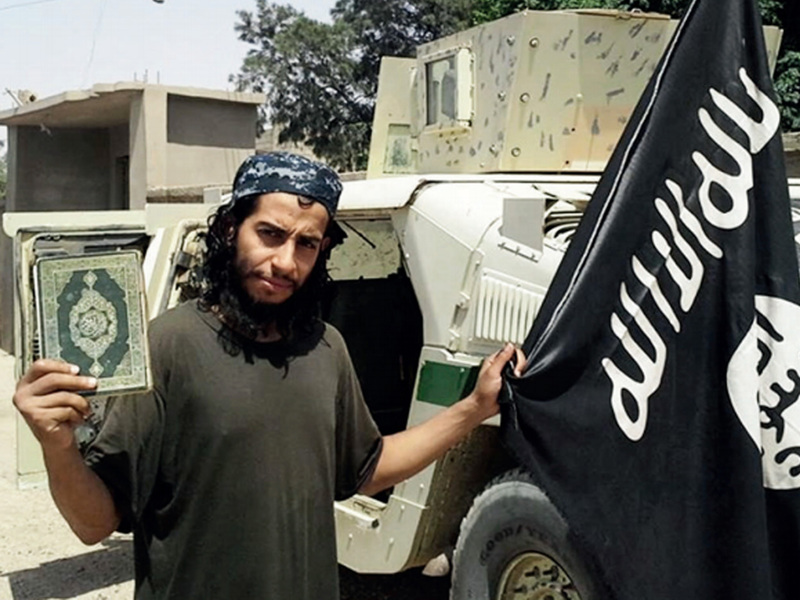 The next month, Abaaoud was quoted by the Islamic State group's English-language magazine, Dabiq, as ridiculing the inability of Western law enforcement to bag him. He said he secretly returned to Belgium to lead the terror cell, then escaped to Syria despite having his picture broadcast across the news. "I was even stopped by an officer who contemplated me so as to compare me to the picture, but he let me go, as he did not see the resemblance!" Abaaoud said.